Now, press Alt+F2, type in “r” without quotes and press enter. This will reload Gnome-Shell and the changes will come into effect. I am using Fedora 15 with Gnome 3. The window title bars have only a Close button as control button. If you want to add other buttons here is what you need to do. You can skip to step 2 if you have Configuration Editor installed. Press Super (Windows) key and type Add/Remove and open Add/Remove Software. Search for gconf-editor and install it. You may need to wait a while if you are using Add/Remove Software for the first time. The changes are not instant. You either need to restart Gnome shell using Alt+F2 > r > ENTER (as reader Elliot pointed out in the comments) or you need to log out and log back in to see the changes. I have used Ubuntu Lucid since its early alpha stages to the final and then continued using it until lately. I am used to having title bar control buttons (i.e. maximize, minimize, close) on the left side of the window. 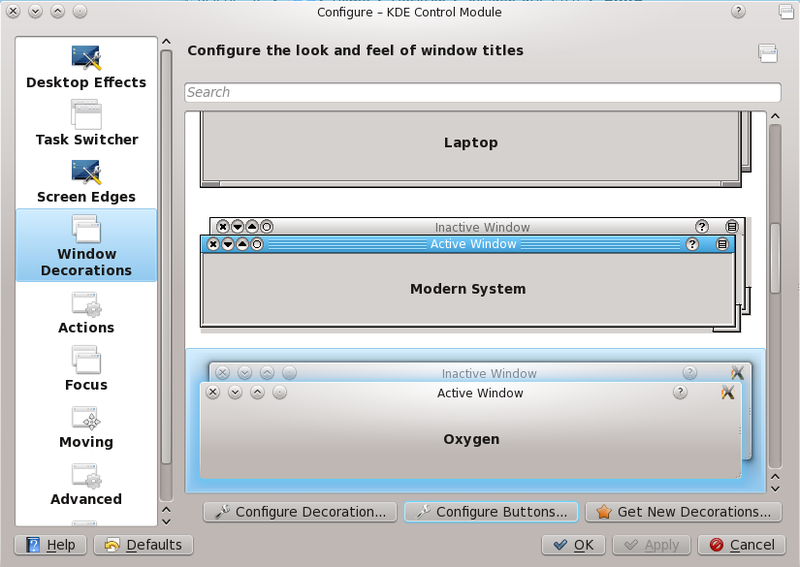 I recently moved to Fedora 14 KDE Edition and was having problems with the control buttons. So, I moved them to the left. Here is how it is done. 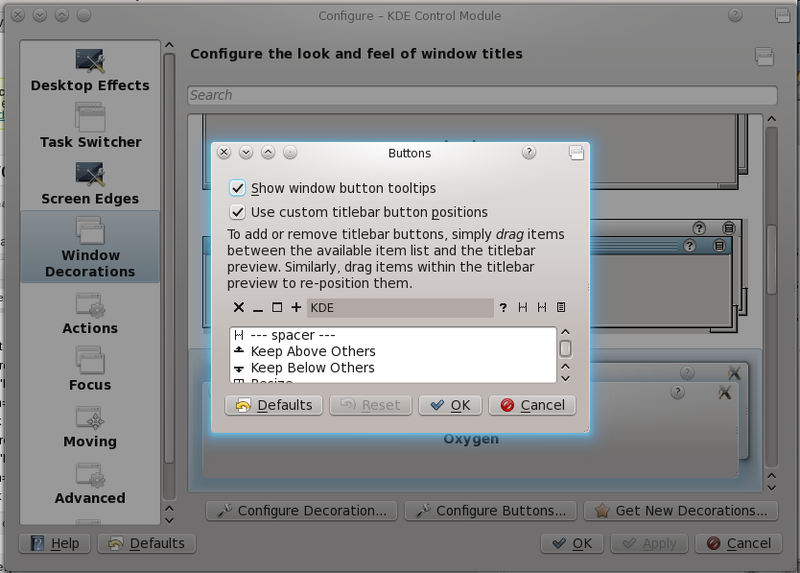 Right click on the title bar and select “Configure Window Behaviour”. Click on “Window Decorations” in the left pane. Click on “Configure Buttons” and you should see your current title structure. Drag around to get the following configuration. Thank you to everybody who has participated in this discussion. The decision is based on the view that putting the close button in the corner will be most familiar to many users, even if the particular choice of corner is not. Our intent is to encourage innovation, discussion, and design with the right of the window title bar. We have some ideas, and others are already springing up in the community. We welcome participation on the Ayatana list, where those can play out. This will be a fruitful topic for the design track at UDS in Brussels in May. This bug is now marked wontfix. Please focus ongoing participation on the opportunities for innovation that this opens up. The decision as to the window controls location and order itself is now final, and as they say in the old newspapers, no further correspondence will be entered into. I think the idea of moving the buttons (maximize, minimize, close) to the left side was not a good idea in the first place. It contradicts with the default layout of GNOME DE (and hence almost all other distributions using GNOME) and does not provide any value (as of now). Also, doing this starting from an LTS release was not a good idea at all. It is not difficult to adapt to the changes (I already have adapted to the latest mac like changes) for someone who uses Ubuntu as the only OS, but since Ubuntu is widely used in PCs, alongside Windows, it will be difficult for a user to use Windows and Ubuntu. It is easy to have another layout (just by switching to a different theme or following my older post), but still it is not a good out of the box experience. The other thing that concerns me here is that Shuttleworth said “Ubuntu is not democracy” and trying to turn into next Steve Jobs. Ubuntu is by far, the most popular Linux distribution, but with steps like this, it could turn around very easily. The difference is the order in which they appear. UPDATE April 2: The button order in Lucid will now follow Mac OS X style.